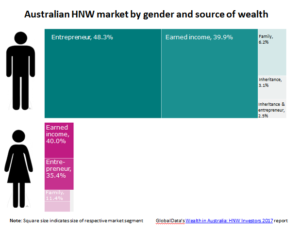 The number of female HNW (High Net Worth) individuals in Australia is less than 10% of total HNW individuals, but they represent a growing opportunity for wealth managers with new financial services to offer, according to GlobalData, a recognized leader in providing business information and analytics. The company’s latest report reveals that out of the 82,438 HNW entrepreneurs in Australia 6,733 (or 8.2%) are female but according to Global Entrepreneurship Monitor women constitute 39% of Australians starting a new business. Therefore female entrepreneurs with a need for bespoke financial services represent an attractive opportunity for wealth managers especially as there are fewer dedicated products being offered to this demographic. In addition, given the above-average age of the male HNW population (compared to the wider region and the female segment), it is likely that many current male business owners will be handing over responsibility or ownership to their spouses in the coming years, bringing more women into the HNW bracket through inheritance. Competition to appeal to female HNW individuals looking for finance or investment services is fierce, with the vast majority of wealth managers reaching out with designated programs. Westpac is one of the few players in Australia with a unit exclusively dedicated to supporting women and female entrepreneurs. “As such Westpac’s private bank is well positioned to capitalize on the growing number of female business owners”, says van den Hövel. Over the past few years, a number of robo-advisors targeting female investors have entered the market like Ellevest and WealthFM in the US, while in Asia; Miss Kaya claims to be the first women-focused financial platform. “It would be great to see more private banks support female entrepreneurs with financial services that recognise this segment’s distinct needs”, added van den Hövel. To get in touch, please email pr@globaldata.com.